From time to time, questions are raised about the value of classes which offer students the opportunity to engage in “professional practice” within a university curriculum. Some science faculty recognize the value of experiential learning but question the worth of any experience that is done outside of a science laboratory. Classes such as Draft Horse Husbandry for example, which is offered at the University of Massachusetts as part of the Sustainable Food and Farming curriculum are questioned as being appropriate for a major research university. This blog was adapted from some writing I shared with my own university colleagues as part of a discussion regarding the role of “practice” in higher education. The tension between the perceived value of scientific education (mostly associated with lecture halls and laboratories) vs. professional practice (often associated with the world outside of the academy) goes back to the beginning of my own institution, the University of Massachusetts Amherst. In fact, right from the beginning concerns were voiced by faculty of the “old college” – the prestigious Amherst College – about the “new college” – Massachusetts Agricultural College (Mass Aggie). Indeed, the namesake of my own academic department, the Stockbridge School of Agriculture – Levi Stockbridge, and his colleagues were engaged in this debate 150 years ago. 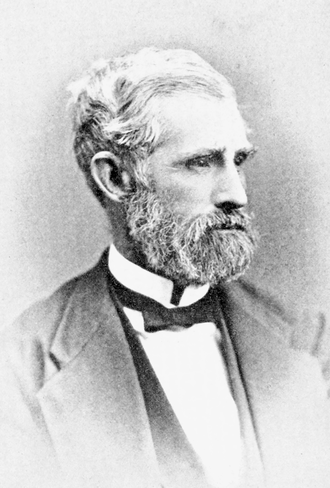 Two members of the original “faculty of four”, William S. Clark, professor of botany and horticulture, and Henry Goodell, instructor of literature, were educated at Amherst College. Charles Goessmann, professor of chemistry, was educated at the University of Gottingen, in Germany. Interestingly, the namesake of the Stockbridge School of Agriculture was educated in the “field of professional practice” as a Hadley farmer and self-educated in science. He never earned a college degree. Nevertheless, he was one of the most successful and revered professors in the early history of the institution. Agricultural (professional) practice was a core value of the “new college,” setting it apart from the “old college” from which many of the early instructors were borrowed. Bowker writes “…we dug ditches, as instruction in drainage, we cut down and uprooted apple trees, as lessons in forestry, we leveled Virginia fences and graded land, for landscape effect and education, we milked cows and groomed horses, which I suppose would come under the head of veterinary science and practice; we mowed grass and harvested corn, which undoubtedly must be classified among the arts of agriculture.” While students no longer dig ditches, they are encouraged to engage in “enterprise” projects such as the UMass Student Farm & CSA described in the video here. 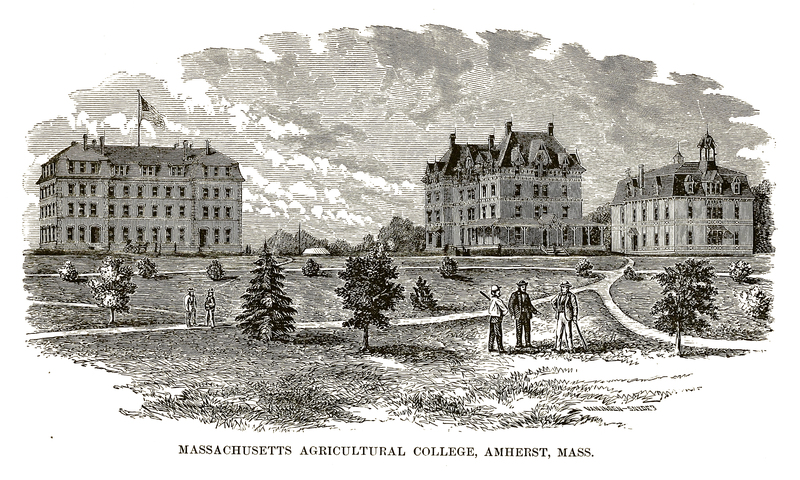 Professional practice has long been a critical component of the educational experience for students in the “new college.” Members of the “old college” – Amherst College – disparagingly called the new Aggies “bucolics” – and deemed practical education unworthy of the elite members of the more aristocratic neighbor. But Levi Stockbridge never denied the difference between the two educational approaches, seeing them as complementary and of equal value depending on the career goals of the students. 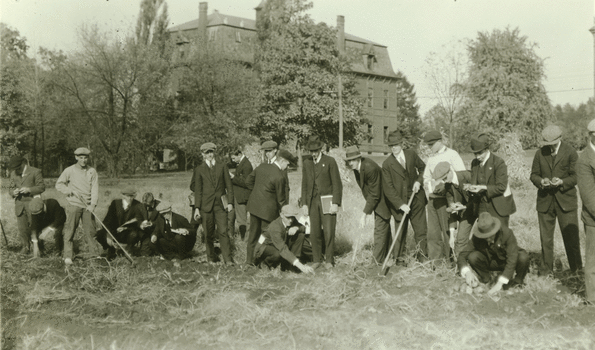 Notice the early students of Mass aggie were equally comfortable holding books, taking notes, and using long handled implements in this early photo. They look to be digging potatoes in suits and ties! Its hard to criticize the Dean of the College of Natural Sciences, Dr. Steven Goodwin (picture below) for his rather formal dress while working draft horses at the UMass Undergraduate Agricultural Learning Center….. when you see that the original “aggies” seemed comfortable in formal dress attire even while working in the field! But for all that – “Mass Aggie” was never a narrow, technical training school. According to Henry Bowker, the college offered “…in the broader sense of teaching all the natural and applied sciences which are related to agriculture, and at the same time, while training men along vocational lines, of giving them as liberal an education as possible in order to fit them to be good citizens and to do their part in society.” The legacy of Levi Stockbridge and the other members of the “faculty of four” is a balance of science and professional practice, something the Stockbridge School of Agriculture strives for today. Right from the beginning, the early professors put value on scientific research. Here is Bowker quoting the first president, Henry Flagg French, “let us pursue our study beyond the mere instruction of classes in their prescribed courses, and endeavor, by careful experiment in the field and careful investigation in the study and laboratory, to make discoveries in science and to enlarge the boundaries of existing knowledge….” The legacy of Mass Aggie is education in both science education and professional practice. The Massachusetts Agricultural College and its “offspring” the Stockbridge School of Agriculture were created with a specific intent “to make agriculture its leading subject” and further to “include, manual training in its curriculum.” The legacy of the early days of Mass Aggie, and particularly of Levi Stockbridge, who was described by Bowker as “no doubt the peer, if not the superior, in native wit and capacity” of the other members of the faculty, was to establish the value of practical education built upon a solid foundation of science. 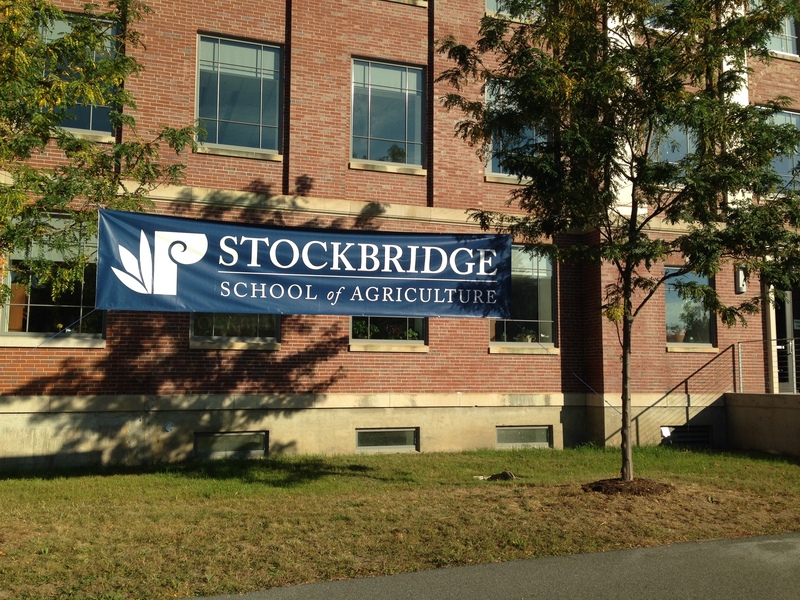 The legacy of science and professional practice lives on in the laboratories, fields, and particularly the students of the recently expanded Stockbridge School of Agriculture. Students in the four B.S. degrees, the 6 A.S. degrees, as well as those working toward graduate degrees under the supervision of Stockbridge faculty remain proud of the legacy of science and practice established by the founding faculty of the University of Massachusetts. Remember that prior to the Morrill Act of 1862, signed by President Lincoln, all of the colleges in the U.S. were private institutions offering education only to the wealthy. Stockbridge himself, was frustrated because his father could only afford to send one of his son’s to Amherst College, and his older brother Henry was chosen. Nevertheless, Levi attended classes with his brother, and was mentored by Amherst College President Edward Hitchcock in chemistry. Public institutions, such as Mass Aggie which offered a free college education for many years to anyone qualified, was a radical departure from the elite colleges of the day. Judge French had strongly held democratic tendencies and claimed that Mass Aggie should “… differ essentially from any college existing in the country controlled by an aristocracy.” Further, he wrote in one of the first reports ever coming from the nascent University of Massachusetts Amherst that “wealth and education, monopolized by any class in any country, will draw to that class the political control of the country.” Sounds like Judge French would have camped out with the protesters at the Occupy Wall Street site! One of my favorite quotes from French is above. He believed that we must “recast society into a system of equality.” Indeed he fully understood the purpose of the Morrill Land Grant Act of 1862, which was passed “to promote the liberal and practical education of the industrial classes…” (meaning the 99%)! These are principles we should try hold true today….. Quotes in this essay were taken from an address by Henry H. Bowker, trustee of the college, at the 40th anniversary of the Massachusetts Agricultural College, titled “The Old Guard; the Famous ‘Faculty of Four’ – the Mission and Future of the College – its Debt to Amherst College, Harvard College and other Institutions” presented on October 2, 1907. Previous PostClimate Change News from New YorkNext PostWhere will the agricultural college graduates work?